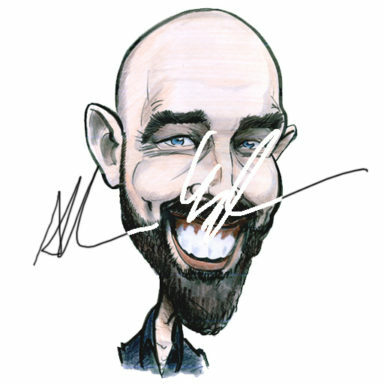 Caricature Artist Allan Cavanagh has produced live caricatures for Yelp, Google, Amazon, Ulster Bank, Brown Thomas, Bank of Ireland, and many other organisations around the country, for staff and customers alike. 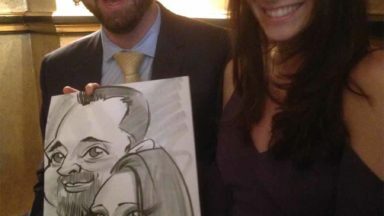 His live caricatures are much sought-after for weddings, where he draws guests on personalised paper. His customised caricatures are also very popular for retirements, birthday gifts, and wedding presents. 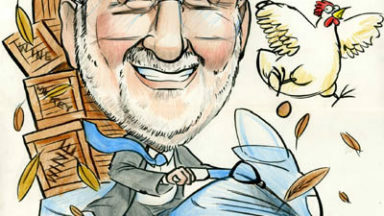 His cartoons have appeared in various publications, including Hollands Diep magazine and a school textbook in Germany. 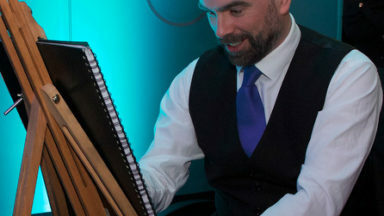 He has exhibited in Galway, France, Algeria, and the Netherlands. He represented Ireland at the 49+ la BD Francophone Cartoon Festival, Tourcoing in 2008 and in 2009 represented Ireland at the 2eme Festival Bande Dessinee in Algeria. He contributed weekly cartoons to the Connacht Tribune for most of the ‘00s alongside Charlie Adley’s Double Vision, as well as devising health promotion material using cartoons, with the HSE and Galway Traveller Movement. He has produced on the spot cartoons at conferences for the HSE, NUIG, and the NHS among others, based on the themes being presented. 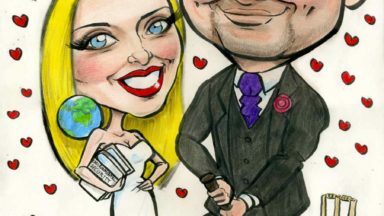 Caricature Gifts Ireland for Weddings, Retirements, Birthdays, Anniversaries, and Christmas!